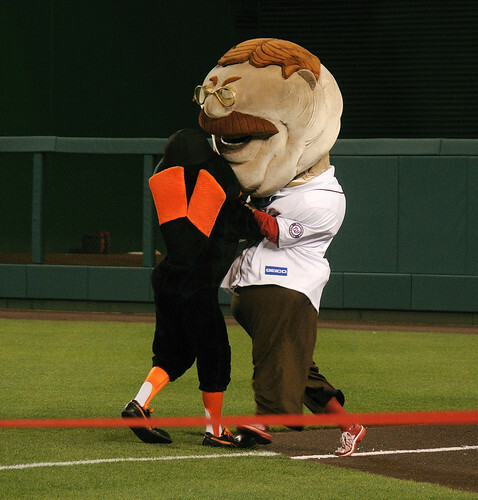 Wrestler John Cena pumps Teddy up to tackle Orioles Bird | Let Teddy Win! The largest crowd at Nationals Park since opening day was rewarded richly Friday night after an hour-long rain delay postponed the start of the game. The Nationals continued their torrid offensive streak with the 7th win in a row, and Teddy Roosevelt, despite losing the 4th-inning presidents race, delivered a satisfying blow to a longtime nemesis. 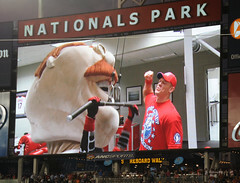 Following Tuesday night’s appearance at Nationals Park, WWE wrestler John Cena appeared Friday in a series of scoreboard video segments with Teddy Roosevelt, teaching Teddy his “You Can’t See Me” moves, and pumping up the Nats’ perennial loser both literally and figuratively in preparation for a visit from the Baltimore Orioles and their not-so-creatively named mascot, The Bird. Before the game, The O’s fowl cheerleader pranced around Nationals Park like he owned the place, trying with little success to incite the smattering of Baltimore fans in attendance. When the presidents race began, The Bird jumped out in front of the presidents, threatening to steal the thunder from the home town mascots; but with Teddy chasing closely behind as they turned the right field corner, the partisan crowd cheered in anticipation of what was to come. Teddy put his newly-learned wrestling moves to use, catching The Bird and taking him down with a satisfying blow. The antics would have to be satisfaction enough for Teddy’s long-suffering fans, who then watched George Washington blow by for the win. 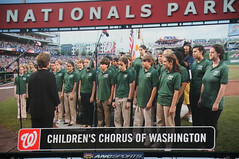 A special nod to members of the Childrens Chorus of Washington, who did an amazing job with the National Anthem Friday night, and could be heard chanting the most beautiful chorus ever of “Let Teddy Win! 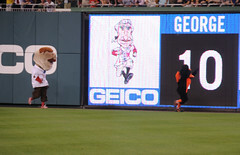 Let Teddy Win!” from the 400 level during the presidents race!